Add the flaxseed oil, garlic, chili flakes and salt to a cold pan and heat over medium high heat until the garlic begins to sizzle and cook. Add the cherry tomato halves and continue heating until the tomatoes start to soften before adding the white wine. Cook out the wine until it has evaporated by at least half then add the cooked linguine with some of the pasta cooking water (enough to coat the noodles). Continue heating until the pasta is coated with the oil sauce, add the chopped parsley or kale and serve. 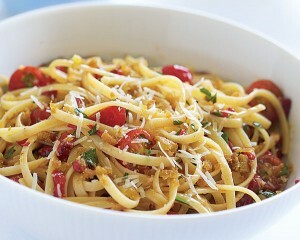 Top each portion of pasta with some parmesan cheese before serving if using parmesan cheese.